For die-hard hikers, a quality backpacking pillow may seem like a luxury that few can afford, or at the very least an after-thought. Go on the ultralight backpacking forums asking for pillow advice and get prepared for a beat down! Depending on who you ask, a backpacking pillow is either a crazy luxury, waste of space or the difference between having a great trip and a horrible one because of a stiff neck. Luckily there are several options on the market that make the trade offs between comfort/space/size so you can choose the one that works best for you. 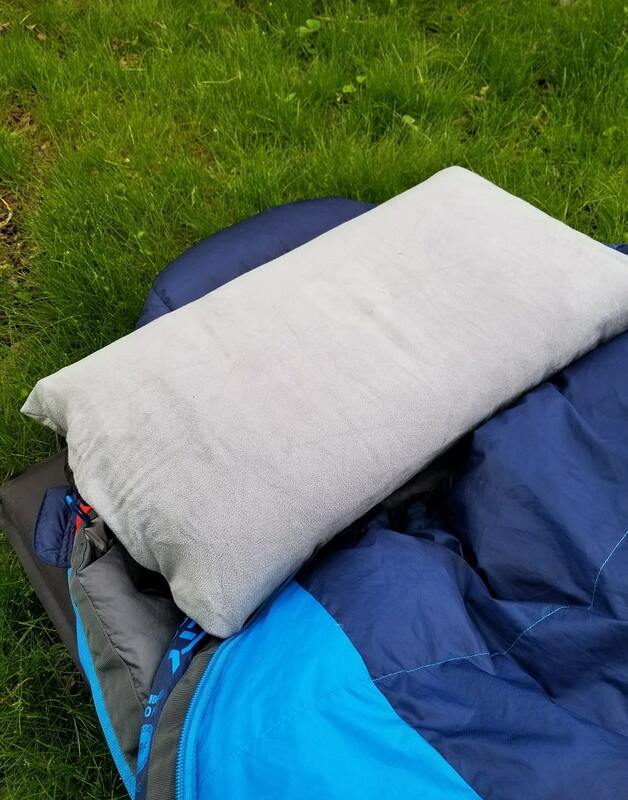 The Thermarest Compressible pillow is by far the most comfortable pillow we tested and you don't have to worry about any malfunctions since it isn't inflatable. Because it's filled with foam instead of air, it provides better support for your neck and prevents your head from rolling around which was a problem with all of the inflatable pillows we tested. 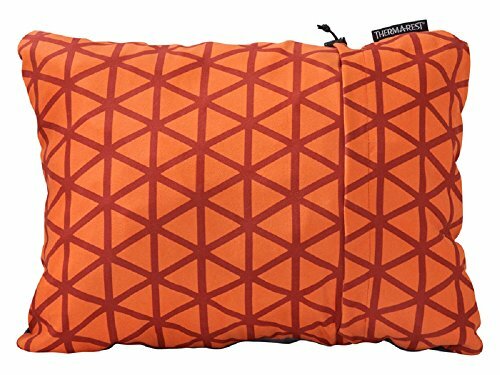 The Thermarest compressible pillow is totally unique compared to most backpacking pillows on the market. Instead of optimizing for weight and space, Thermarest chose to focus on comfort and neck support. The spongy foam inside of the pillow can take a little while to expand but once it does, this pillow feels almost as comfortable as what you'd sleep on at home. The inflatable pillows we tested never felt like a 'real' pillow and were difficult to inflate enough without making our heads roll off the pillow. Our only complaint is that the foam inside the Thermarest pillow doesn't compress down very much so it takes up more space in your backpack. If you have a pack smaller than 50L, you may want to opt for something a little smaller. Our choice for best ultralight pillow goes to the Naturehike/Marchway inflatable pillow. This pillow was the most comfortable inflatable we tested and it packs down smaller than a can of Coca-cola. The Sea to Summit was long considered the king of ultralight pillows but there have been a lot of knockoffs coming from China that are actually better than the original. The Sea to Summit Aeros pillow has long been hailed as the king in ultralight inflatable backpacking pillows. It packs down incredibly small but provides ample support for your neck. Nobody would classify this pillow as 'comfortable' or 'luxurious' but if you're trying to cut down on weight and conserve space, it gets the job done. But in the last couple of years there have been a ton of competitors copying the Aeros design and even improving on it. These knockoffs from China are wider than the Aeros and have a lower center, with raised edges. Since inflatable pillows have a tendency to let your head easily roll off, these raised sides help keep you centered on the pillow and we slept much better on the knock offs than we did on the Aeros. The knockoff pillows cost about 1/4 what the Aeros costs and pack down to the same size. 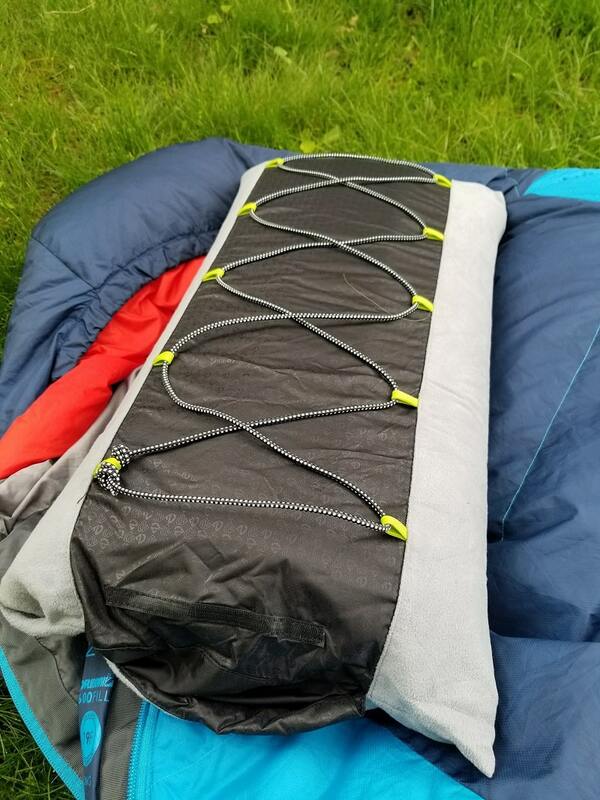 The only complaint we had is the same as all inflatable pillows; it's just not as comfortable as the Thermarest compressible and isn't worth the space savings to justify the loss in comfort. I am a backpacking fanatic. I live in Michigan and have backpacked the Manistee River and Manitou Island. I flew out to Colorado last year and spent a week in the Rawah Wilderness and this year I'm going out to backpack in Grand Teton. Whenever I get a chance to get out in the wilderness I take it and I've been able to field test a ton of gear over the years. I've spent hundreds of hours reading reviews and first hand testimonies from other backpackers on what they liked and didn't like about every piece of gear. I hate when I buy a crappy piece of backpacking gear only to upgrade later; I like to buy the right gear from the beginning and not have to worry about it breaking down or wearing out in 6 months. Not everyone is going to want a backpacking pillow. If you're trying to cut down on weight/size and you're looking to trim every last ounce from your list, a pillow should be the first thing you cut out. Personally I I'm OK sacrificing a little weight in order to have a more enjoyable backpacking trip which is why I always bring a flask of whiskey and a pillow. These aren't necessities but they can make your time in the back country way more enjoyable. If you've struggled with a sore neck on your backpacking trips before or if you have a hard time sleeping when you're camping, a pillow can make a huge difference. You can wake up hundreds of times per night for just a brief second and you won't remember that at all in the morning because you fall back asleep so quickly. But if you wake up feeling groggy and unrested, it could be from poor sleep caused by a bad pillow. Your neck is also part of your spine which is where you carry your backpack. Having a sore neck in the morning could cause back pain later in the day after carrying your backpack up and down mountains. All the parts of your body work together and if you don't treat them right, it can cause unexpected problems in other spots. 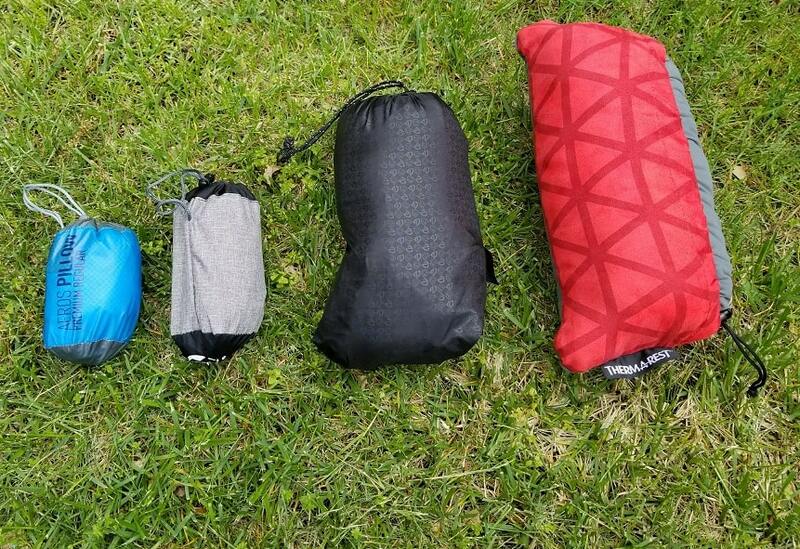 Which Backpacking Pillows Did I Test? Inflatable pillows are made of two parts: an interior bladder that you fill with air and an outer shell for your head. Usually the inside bladder is made of a thicker plastic so you don't have to worry about it getting punctured. Some inflatable pillows also have baffles inside that help keep the air evenly distributed to prevent your head from rolling off of the pillow. 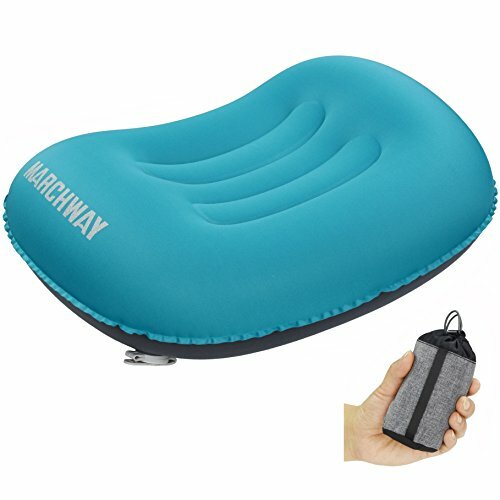 These are usually the cheapest types of backpacking pillows because they don't have much to them. Some of the nicer models will have multiple valves for inflating and deflating so you aren't rushing to close the valve before all of the air leaks out. Inflatable pillows do have a noticeably different feel from a traditional pillow. Because your head is resting on a big plastic bladder full of air, it's easy for your head to roll off the pillow. You'll usually want to fully inflate the pillow then release air slowly until you find a comfortable fit. It can also be more comfortable if you put some of your clothing under the pillow for a little more cushioning. Inflatable pillows will also usually weigh the least and pack down the smallest because they don't have anything inside of them once you let the air out. These pillows are made for ultralight backpackers and people doing long through hikes where every ounce and every square centimeter of space counts. Compressible foam pillows are made of, well, foam. Thermarest makes their pillows with leftover pieces of foam that was used to make their sleeping pads. Foam pillows don't require any inflation but they do need to sit for a little while before they're ready to use. After being fully compressed it takes about 30-60 minutes for the foam inside the pillow to fluff up and come back to it's original shape and size. Since foam pillows don't require inflation, there's no risk of being punctured or damaged in any way. Foam pillows are basically invincible; their only weakness being water. But if your pillow is getting soaked in water then you probably have bigger problems than a soggy pillow. Stuff sacks are just bags that hold clothing as a makeshift pillow. These take up the least amount of room since the only additional gear you're carrying is the fabric sack. If you're looking for the lightest weight and smallest option, this is it. But it comes with trade offs. Stuff sacks aren't very comfortable and they depend a lot on your clothing. You'll need at least a few shirts and pants to fill one up to a size that's similar to an inflatable or foam pillow. If you run out of clean clothes you'll be stuck with dirty clothes inside your pillow which might not be that great to sleep on. 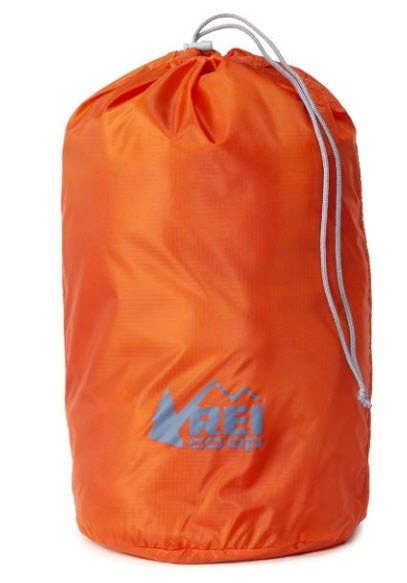 Stuff sacks are usually cheap, lightweight, and simple. But what you gain in ease of use, you give up in comfort. For this test we didn't try any stuff sacks. If you want to test a stuff sack just put a couple of shirts under your head and you'll get the jist of it. There's not a lot to investigate and how comfortable a stuff sack pillow is depends 100% on what you put in it. If you only wear denim shirts and denim pants then your pillow is going to be as bad as your fashion sense. If I had to use a stuff sack, I'd put my dri-fit base layer inside of it. I wear the dri-fit layer to stay warm at night and it's really soft and lightweight so it would make a good pillow. I set up my sleeping pad and sleeping bag and slept on the pillows for a couple of nights each, easy enough. The only way to know how a pillow performs is to sleep on it for several nights. Even if you go to an REI store and test out some of the pillows, you won't get a true feel for how the pillow will perform until you get a chance to sleep on it. Testing a pillow in the store is better than nothing, but you need a full night's sleep to really tell how a pillow holds up against the competition. In between testing each pillow I went back to sleeping in my bed on a regular pillow to reset my body. Even though these backpacking pillows are good, none of them are as good as a real pillow so I wanted to make sure my body was "reset" before I went on to the next pillow so I wasn't experiencing any lingering effects from the prior test. 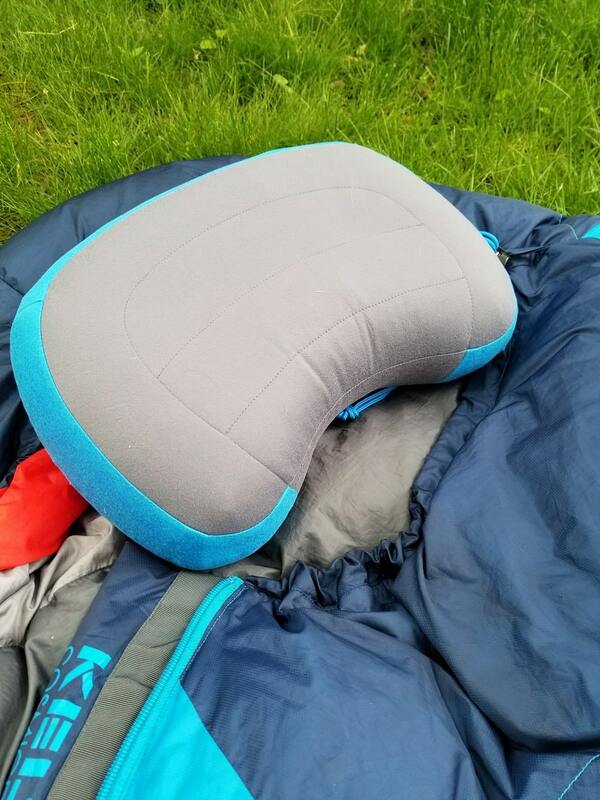 ​The Thermarest Compressible Pillow was the overall winner because of the ​amazing foam filling that holds your head in place​ better than any inflatable pillow. This is the only pillow we tested that could ​double as an everyday pillow in your house. It's that comfortable. Most backpacking gear is meant to be lightweight and there are usually some trade offs you make since you're 'roughing' it for a few days in the wilderness. ​The cover of the pillow is brushed polyester which somehow manages to feel like a real pillowcase. The outside of the pillow is really soft and the pillow comes in several different sizes. I tested out the small size which is 12" tall, 16" wide, and 4" thick. I'm 6'1 and have a pretty normal size head (in my opinion) and this pillow is plenty big. I definitely would not buy a larger size unless you're using this pillow strictly for car camping. This pillow is by far the biggest out of all the pillows we tested so you're already making a sacrific on space. You can help yourself out by ordering the smaller size which will help reduce the impact on your space usage. ​The back of the pillow is also a soft, polyester material but it's not quite as comfortable as the front. The red part is where the pillow tucks inside itself when you pack it away. The draw string on the left side of the pillow helps keep it compressed when it's packed down. Thermarest is known for their high quality sleeping pads and their pillow is no different. Every part of this pillow feels high quality and is nicely manufactured. There aren't any defects or any weak points and it feels like this pillow will last a very long time. Just like sleeping bags and sleeping pads, you'll want to store this pillow uncompressed. This helps keep the foam nice and lofted so it's ready to go when you hit the trails. If you want to see the pillow in action you can check out this video. Note that this is the larger version of the pillow. I can't imagine fitting that in my pack; remember, buy the small version!! 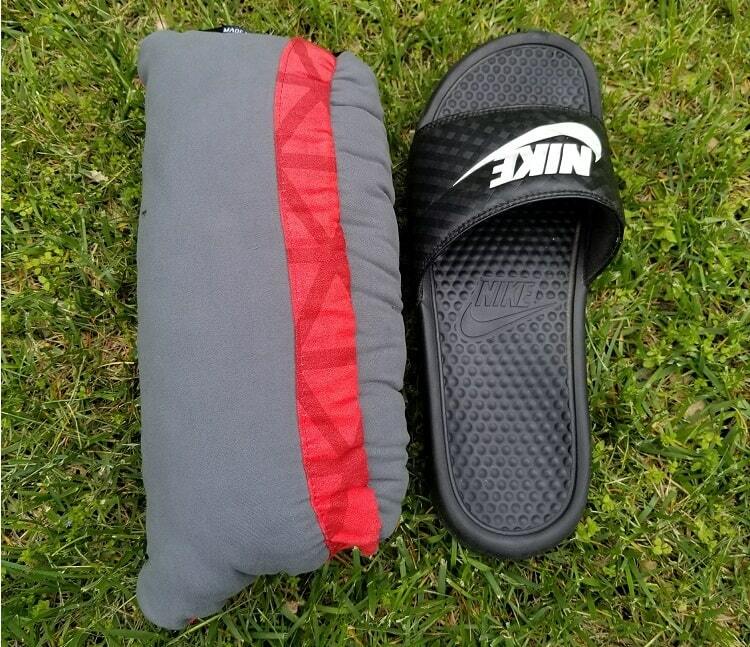 The Thermarest foam pillow compresses down to about the size of a sandal (men's size 10 for reference). For the same amount of space, you could fit about 5 of the Sea to Summit pillows. The trade off you make with the comfortable foam filling is that it doesn't compress very much and just takes up more space; there's no way around it. Here's a side by side comparison of all 4 pillows we tested so you can get a feel for how much bigger the Thermarest pillow is. ​And up close, you can see how the pillow tucks inside of itself. The draw string is hidden in this picture but you can see where it cinches down the red part of the pillow and holds onto itself nicely. This won't open up in your pack or come loose; once it's packed down it's staying put. ​The most well known inflatable pillow is the Sea to Summit Aeros. Depending on where you buy it from, you're usually looking at spending $30-$40. There are some Chinese knock off pillows on Aliexpress that only cost $10 so I bought one of those to compare to the real deal. It took about 2 weeks to arrive to me in Michigan but it arrived in great shape and didn't have any damage from the long journey. ​After looking on Amazon I found a couple people selling identical pillows to the Naturehike (actually $.50 less than the one from China!) and they come with Amazon Prime. Performance wise I found this pillow to be even better than the Sea to Summit Aeros. Yep, the knock off pillow is better than the original. Crazy!! 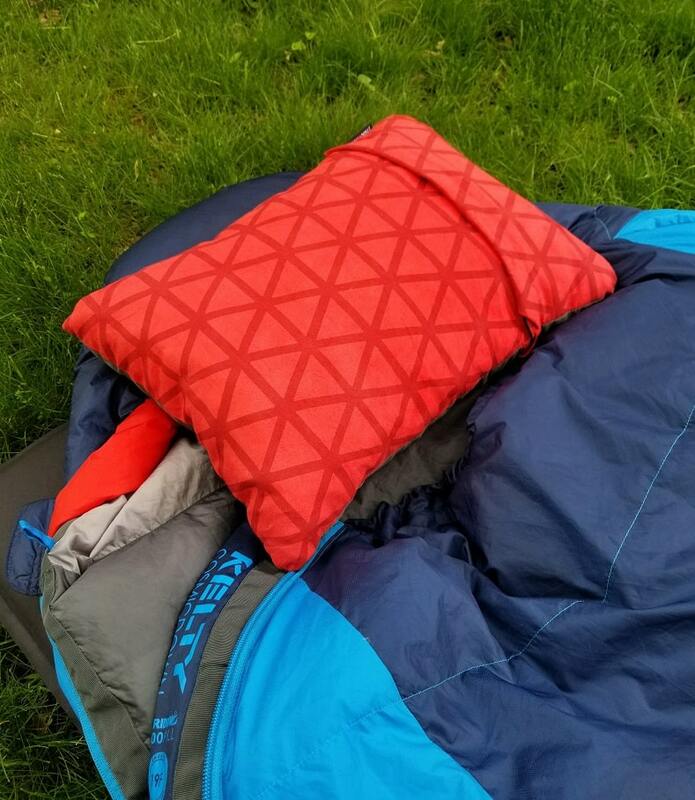 ​The NatureHike pillow has a nice cradle effect in the middle because of the raised side walls which prevents your head from rolling around on the pillow. My #1 complaint with inflatable pillows is they let your head move around too much so even if you get the air level right, the pillow still doesn't feel right because it's too easy for your head to roll around. By creating two contoured divots in the middle of the pillow and raising the edges up, your head stays firmly in the middle of the pillow and I didn't have any problems rolling off this pillow at night. 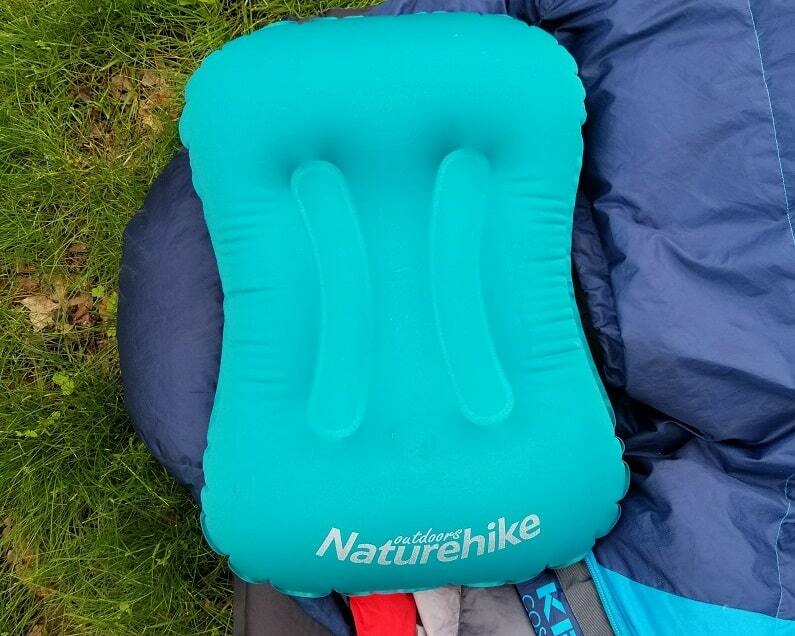 The picture below clearly shows the curves on the NatureHike pillow that made it so nice to use. 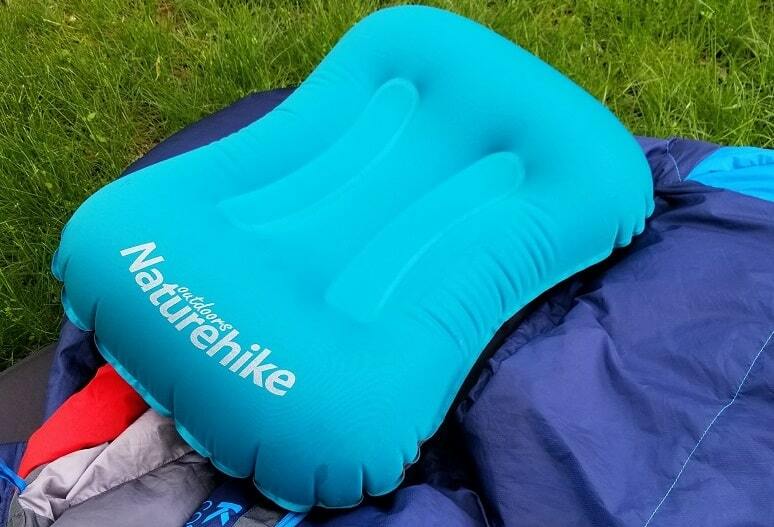 ​Of course, the NatureHike suffers from the same fate as other inflatable pillows. Sleeping on a plastic bag of air is just not comfortable. It doesn't feel like a real pillow and I found it impossible to get the right level of neck support. If you inflate the pillow all the way then it's too firm to be comfortable. When you let some air out to make it usable, your head is laying too low and your neck is at a bad angle. My solution was to stuff some clothing underneath the pillow after I let some air out. The NatureHike has a 1-way valve with a small button you can press down to let air out. It works really well and lets you fine tune how much air is inside of the pillow. After letting out a little bit of air I was able to get the pillow to be somewhat comfortable. I stuffed a couple folded up shirts underneath it for some height and I had a reasonably comfortable set up for an inflatable pillow. ​For $10, the NatureHike is an incredible value. It packs down really small and weighs just a few ounces. If you're focused on saving weight and space and you're willing to give up a little comfort, this is your pillow. ​The NatureHike is a little bit larger than the Aeros when it's fully compressed but not my much. It's noticeably smaller than both the Nemo Fillo and the Thermarest foam pillow. ​The other two pillows I tested are the Sea to Summit Aeros and the Nemo Fillo. The Aeros is similar to the NatureHike but not as comfortable. It doesn't have the raised contours on the sides of the pillow so I had issues with my head sliding off the pillow. Inflatable pillows are notoriously difficult to keep your head on and without any 'guard rails', I was constantly sliding off of the Aeros. It's also a very small pillow which doesn't have much forgiveness if you aren't 100% correctly positioned. ​The Nemo Fillo ​is like the byproduct of combining all the other pillows together. It had the bubbly feeling of an inflatable pillow and the gigantic size of the Thermarest foam pillow. It was basically the worst of all worlds and a jack of all trades, master of none. The Nemo Fillo does have a unique design on the underside of the pillow. There are bungee straps that can hold clothes in them to give the pillow some extra loft and support. It's nice that the clothing is held in place, but even with my shirts stuffed underneath the pillow I could never get it to be as comfortable as the Thermarest. ​The Fillo was also the most expensive pillow I tested with the Aeros coming in as the second most expensive. Both of these pillows seem to be coasting off of their brand recognition and they're being outclassed by the newcomers to the category. Both of them need to revamp their design to excel in what they're targeting. The Fillo isn't as comfortable as the Thermarest and the Aeros isn't as small as the NatureHike. If you're going to be more expensive then you need to offer more and neither of these pillows could cut it in my test. ​The Sea to Summit Aeros on the left and the Nemo Fillo 2nd from the right. The Aeros is a little bit smaller than the NatureHike but not by much. The Fillo was gigantic for being an inflatable pillow and if you're going to get a pillow that large then you might as well get the Thermarest and have a comfortable pillow. When I was looking for a backpacking pillow I had a couple of things I was looking for. Here's my list of criteria in order of importance. I put comfort at the top of the list because it's the single most important thing when choosing a backpacking pillow. We're not talking about tents or sleeping bags where you're shopping for an essential item that will save you from freezing to death during a cold night. A pillow is a luxury item that is not necessary in the back country. If you've already decided to buy a non-necessary item then it's because you're looking for an upgraded camping experience. ​If you're going to make the sacrifice on weight and space to bring a pillow, don't skimp out on the comfort! Sure you might save an ounce or two by getting a smaller pillow, but if it's still not comfortable to sleep on then you haven't really gained much. You'll spend 1/3 of your camping trip laying on this pillow so make sure it's super comfortable! I'd recommend sleeping on the pillow at home for a couple of nights before going out in the back country to make sure that you like it. Pillows aren’t the heaviest thing around, but there's an awesome saying that backpackers ​throw around all the time - "Ounces make pounds". When you start to ignore individual items because they only weigh a couple of ounces, you end up increasing your total pack weight by a lot without even noticing. In most areas of backpacking gear, you can always reduce the weight by spending more money. Going from a $50 WalMart tent to a $400 Big Agnes HV UL will let you shed several pounds without making any sacrifices. Backpacking pillows don't follow this trend. There are only so many ways to optimize the weight of a pillow and at the end of the day, most people are looking to maximize their comfort with a backpacking pillow. You'll need to personally weigh the trade off you want between comfort and weight when making your decision. Some people can get by in the back country with a stiff neck for a couple of days so they can save the weight and not bring a pillow, while other people choose to carry the extra weigh so they don't wake up feeling sore every morning. Personally I feel 10x more energetic when I get a good night's rest so I lean more towards comfort and less towards cutting weight out. Out of all the pillows we tested, there isn't a huge difference in weight. Some are definitely lighter, but we're only talking a couple of ounces difference. The biggest difference between the pillows we tested is how small they can compress down. Some pillows like the Thermarest compressible pillow have a foam filling which means it will pack much larger than the Sea to Summit Aeros which is 100% inflatable. So when you're thinking about which pillow to buy, think about the size of your pack. If you have a 45L backpack then you might want to prioritize how small a pillow can pack down to. If you've got a 55L or larger backpack then you can probably fit a larger pillow without any space issues. I put this at the bottom of the list because it's the least important thing to consider. Most pillows are just going to be inflated once per day before you go to bed so they aren't going to be put through a ton of strain. But more importantly, if something does happen and the pillow's valve breaks or you get a leak in the pillow, it's not the end of the world. Yah, your neck might hurt for a couple of days while you're camping but it's not an emergency. For stuff like tents, sleeping bags, or stoves, I'd recommend coughing up the extra money for a reliable, name brand piece of gear. But you don't have to be as careful with pillows since you can get by without one. ​If you've had a chance to test any of these pillows please drop a comment and let us know your favorite and why!